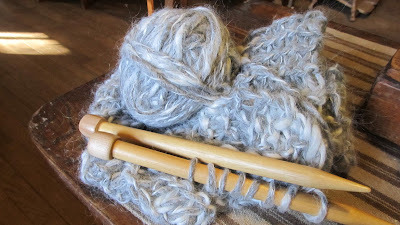 There is nothing better, than sitting by a wood burning stove and knitting a scarf with some beautiful hand spun yarn...warms my soul...we all need to take the time to keep our inner peace fullfilled. No matter how sad I get, or how stressed I am, this takes me to another place, what takes you there? glad you are cosy and enjoying!! lately what takes me there is the woodstove and the kitty, just staring at one or both of them. not sure why i'm not stitching this year, but yours looks lovely! Your yarn is beautiful! I've been spinning by the wood stove lately. It's very relaxing.